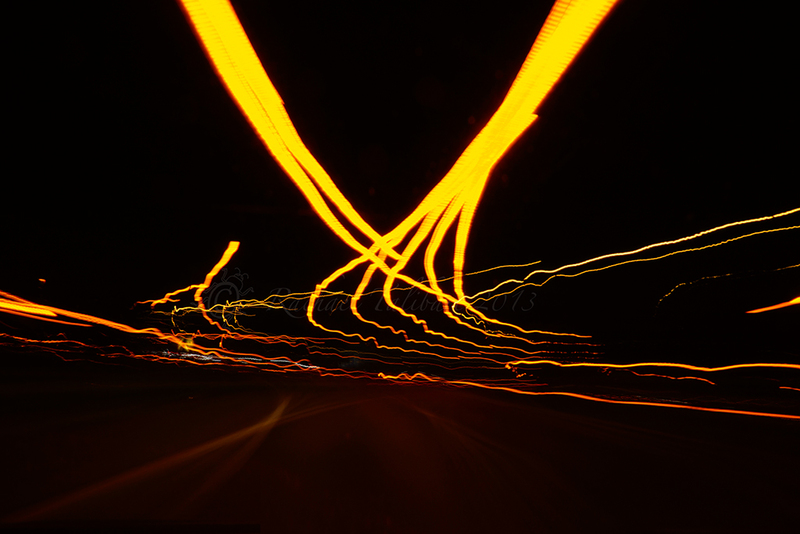 On our journey back from Devon last week, I amused myself with taking some abstracts of the view from my window. I hasten to add that my husband was driving, not me! This technique is very easy. I manually focused beyond the window, then selected a reasonably narrow aperture (between f.14 – f.20) and a low ISO (most of these are at ISO 100). This gave me shutter speeds of between 8 and 20 seconds; perfect to get light streams and to even out the impact of some of the inevitable bumps. I also dialled in some negative exposure compensation. 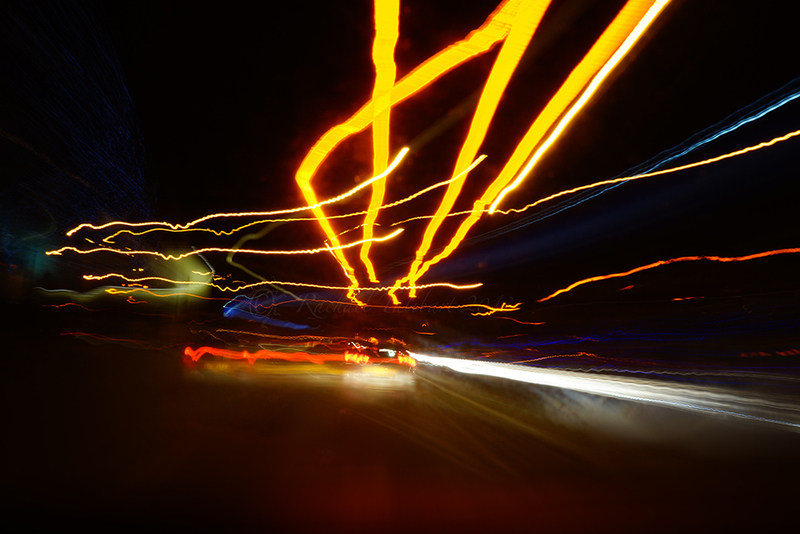 Then I sat the camera on the dashboard and pressed the shutter. I used self-timer too, although as the camera is sitting in a moving vehicle, there will be some movement so any improvement to the shots from using self-timer is minimal. It’s great practice for a photographer who usually likes control. You have to let go with photography like this. That’s part of the fun. Who am I kidding? It’s all of the fun. By the way, I used the Sony NEX-7 for all of these and I think it’s done a fair job. 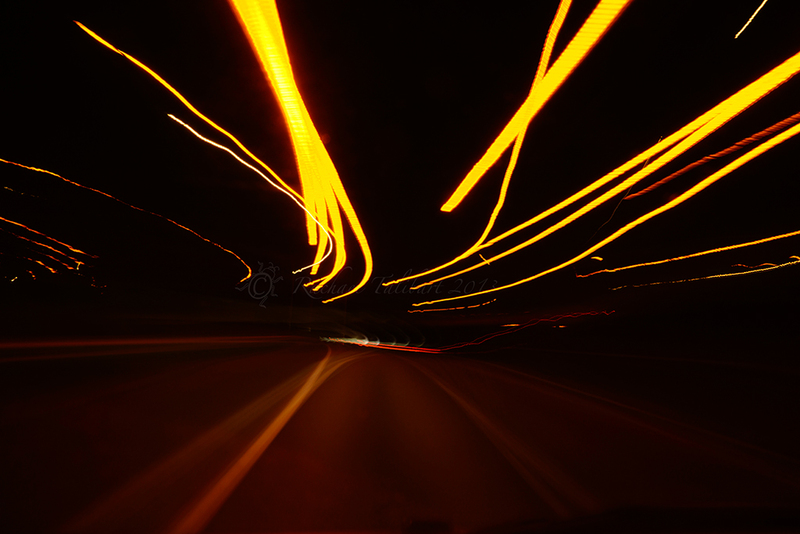 In particular, I think the image stabilisation has coped marvellously with the vibrations from the car. Also, a DSLR would not fit on the dashboard. 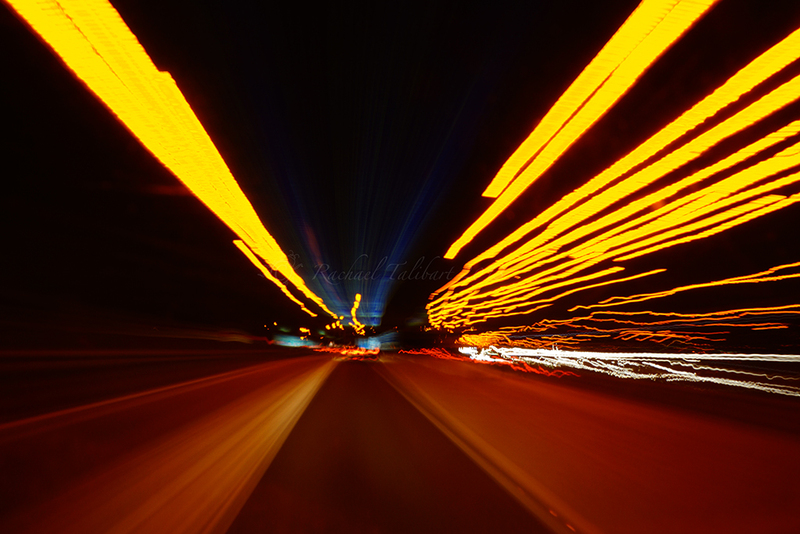 This entry was posted in photography and tagged abstract photography, long exposures, motorway lights, night drive, photographs, photography, photography technique, Sony NEX-7 by Rachael. Bookmark the permalink. Interesting. Sodium street lights must have a strobe effect because where the light position is changing the quickest (just as it goes out of frame) you can see banding appear on the streaks. I never knew that the light from sodium vapour lights wasn’t continuous. I’ll have to give this a try myself. 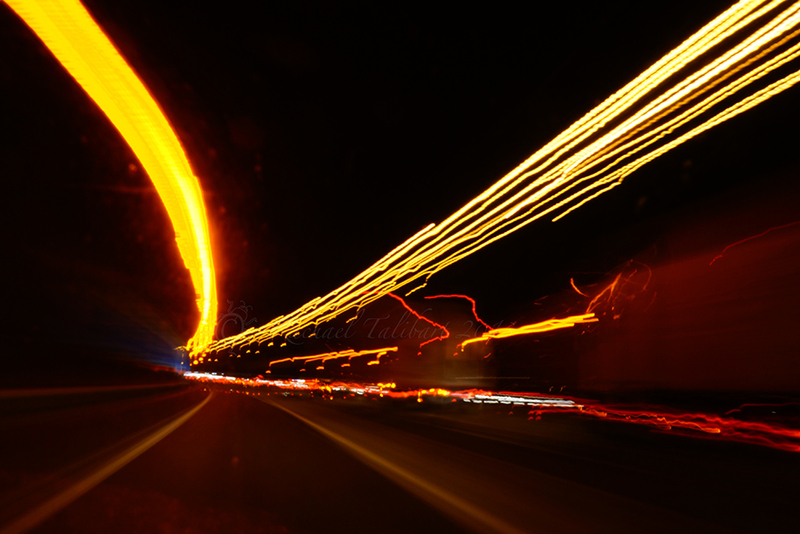 I often take shots from the car when we are driving around on holiday but I’ve always used the fastest shutter speed I could manage; it never occurred to me to use the motion blur before. Thanks, James. Interesting to get a scientific observation. I hadn’t noticed the effect but now you mention it I can see it. Of all those, I like the third one the best. I’d say 2, 3 and 4. Definitely 4. What fun! Thanks. Four is the consensus choice it seems. Another fun thing to try. thanks for the tips! Thanks, Sue. It kept me amused for the entire journey (three hours!). I also relieved it is not just me. Love these! 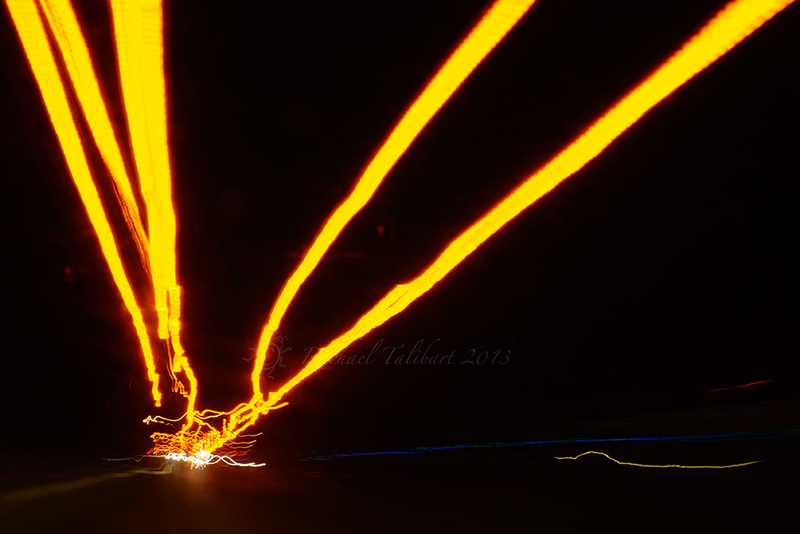 It’s fun seeing what you can get from a long exposure and some pretty lights. Personally, love the 4th one. Feel like I’m getting sucked in! Hi Jaina. Yes,I enjoy this in the rain too. Using a wide aperture to get lovely bokeh lights. All good fun. I think they are great fun and like 4,5,6. Are you going to analyse our choices now, a bit like the inkblot idea?